Scrampin' Mama: It's Time To Make A Change - Weight Watchers Style! It's Time To Make A Change - Weight Watchers Style! I have struggled with weight my entire life. I go up, I go down. And then back up. Each time I go down, I swear I will never go up again. Each time I go up I think, "Meh. I'll start again on Monday." Unfortunately, sometimes Monday doesn't come until a year or so later. Three years ago I was in the best shape of my life, winning weight loss challenges and gearing up to start training for my first 5K... something I had always wanted to accomplish but never tried to do. (Side note: I highly recommend the Couch to 5K program for new runners! It was fantastic.) In July of 2010 I ran my first 5K, in August my second - a trail run, no less. In November of that year, I completed a 5 mile Turkey Trot. From there until now it has been a steady slide back down the hill as I watch all of my hard work and good intentions zip past me. Again. My weight loss didn't work ... didn't stick ... because I didn't actually change me. I would manipulate the system - whatever system it was. For years back in the late 90's, my girlfriends and I would go to Weight Watchers and then go out for dinner at Applebee's. We'd choose weigh-in days close to the weekend so that we had the whole week to recover. We weren't drinkers, but more like weekday dieters. Kick it into gear on Monday and then starve until Thursday and take the weekend off. In more recent years I have participated in weight loss challenges through a local fitness club. There I learned more practical information about eating healthy and losing for life. My husband and I placed in the top three for every challenge we participated in, but when the challenges ended eight weeks later, so did our dedication. I have known for awhile now that I needed to make a change for the better. While that change comes easier for me with the accountability that weighing in with Weight Watchers brings, the biggest change needs to come from me. I need to dedicate myself to eating healthier, to exploring the world of healthy cooking with whole foods. To commit to activity and energy and exercise on a regular basis. Something I had done over the years, but never consistently. I only made temporary changes to accommodate whatever plan I was using at the time. I messaged my friend - the same one I joined Weight Watchers with back in the 90's and early 2000's - and mentioned taking that step one more time. I just tossed it out as an option, still not convinced. She was willing so, like I've been doing with many things lately, I took that leap of faith one more time and we joined Weight Watchers one last time on Saturday, February 16, 2013. I committed myself to healthier choices, tracking, measuring, and living within my Points Plus Value limits all seven days of the week, not just Monday through Friday. My goal is to make healthy changes that I can live with permanently. To not do anything so drastic that I find myself longing for it to end. 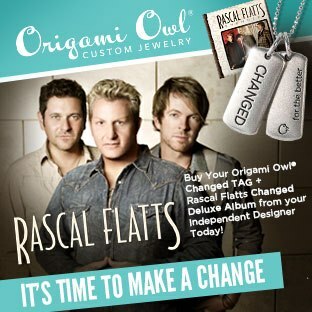 Origami Owl recently partnered with Rascal Flatts to help promote change. Rascal Flatts has an amazing new single out (Changed - worth a listen, even if you aren't a country music fan) and we have designed a new limited edition tag to help commemorate this release. Along with this promotion, Origami Owl has issued a challenge to their designers... a challenge to change. And not only to change, but to tell our story of change. Be a force for good, as the company motto says. In my case, a force for good health. This is my story; this is my change. This past Saturday I went in for my first weigh-in and was pleasantly surprised to see all of the counting paid off. In my first week lost 7.5 lbs. I tracked and counted all seven days and while there was a bit of an adjustment at first as I went from mindless to thoughtful eating, it really hasn't been that bad. And what's more important, I *feel* a change happening inside me. A movement toward health as a lifestyle choice rather than a temporary means to an end. I don't have a number for my goal weight. My goal is only to be healthy, and to keep my family healthy. The fact that I am losing weight along the journey is just icing on the low-fat cake, so to speak. In addition to tracking, counting, and cooking/choosing healthier meals, I am also exercising again. It is frigid in Wisconsin, so I've been bringing out the DVD's, most recently Leslie Sansone's Walk At Home videos and a few Biggest Loser work outs. I have always loved aerobic videos, so this is going great. My biggest issue is finding the extra 45 minutes each day. I've always said that we find time for the things that matter to us though, and I have done just that. Even if I only finish one mile of the three mile walk, it's still a mile. I'm moving, and that's more than I could say for myself last week. 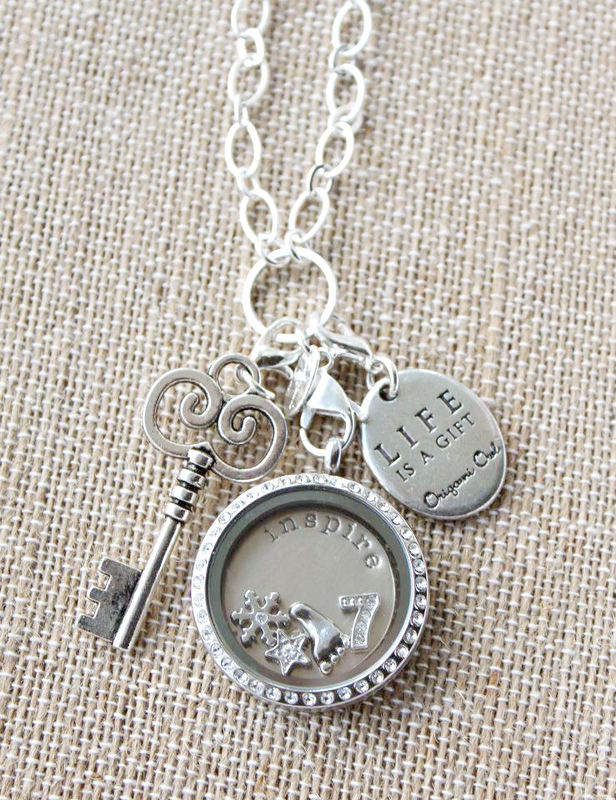 With Origami Owl, we say "Every locket tells a story." Here is the locket I am wearing this week and the story that goes with it. A #7 for my 7 lb loss. A footprint for the 13 miles I walked (at home) this week. A star to represent the one given to me when I reached my 5 lb. Weight Watchers goal. A key to unlock the future, a reminder that life is a gift from God and that I need to take care of this precious gift he has given me, and an inspire plate in hopes of inspiring others to do the same. My hope is that I'll remember to blog my progress as I go. Maybe it will serve a dual purpose by helping to motivate you while helping to keep me accountable. Maybe we can help each other. I also plan to change up my locket each week to keep a tally of my weight loss close to my heart and mind, always incorporating the number of lbs I've lost to date. I'll continue to share them as I reach various milestones or have other info to share. While I enjoy sharing my Origami Owl business with you, and I am thrilled beyond belief at how well this business has taken off for me and how it has blessed my family, this blog is about so much more than that and so am I. In closing, here are some links for a few of the most inspirational healthy living books I've read, as well as links to the DVD's I exercised to this week and a few recipes we enjoyed. Working It Out by Abby Rike - written by a former Biggest Loser contestant who is also a bereaved mother. This book spoke to me on many levels. Water With Lemon by Zonya Focco - the only book I've ever read about weight loss and healthy living that was written in the form of a novel. A fantastic, fast, read. Reshaping It All by Candance Cameron Bure - a great story of faith and fitness. Leslie Sansone Walk Your Belly Flat - An easy three mile walk. Well... "easy" is relative. I think it's easy compared to some of the other dvd's I've done, but it's still a fast paced work-out. This is my go-to dvd this week. I think I logged 9 miles with it. Leslie Sansone 5 Mile Fat Burning Walk - I did this one day, a 2 mile walk. Much faster paced than the one above, and a fantastic workout. Biggest Loser Cardio Max - I did this one night as well. I'll be honest - it's not my favorite work out. The flexibility section is fantastic though, and the cardio gets the job done. I do like that the dvd lets you build your own workout and I selected a 45 minute routine of warm up, flexibility, cardio, and cool down. This chicken/potato/broccoli combo I found on Pinterest. Granted it uses a ton of butter, but my thinking is that it's still healthier than the Large meat lovers pizza on stuffed crust that I might have otherwise opted for. I kept my portions small, and was pleased to see how many meals we got out of the dish by doing so. It was yummy, but had to cook 30 mins longer than noted in the link for the potatoes to be done. Skinny Breakfast Sausage - Very tasty! We had it for dinner with eggs and biscuits. I'm still using up some canned refrigerated biscuits that were purchased prior to my change, but at 4 pts per biscuit (I had one), they weren't too bad. Once we've finished what we have on hand I'll move to making my own biscuits when we want them for less preservatives and sodium. Frozen Yogurt Bites - These didn't go so well. We tried to make them with Jack's favorite yogurt - Stoneyfield Farms Banilla. I had them freezing overnight and some of them still wouldn't set. Most of them ended up in the garbage. If you've had luck with this, let me know what your secret is. This week, and for the rest of spring, we'll be switching to a Thursday night weigh-in to accommodate Soccer Saturday commitments, so this will be a short week for me. 7 lbs won't happen again... nor should it. Slow and steady is the way to go. I'll share again after this weeks weigh-in - hopefully with another, albeit smaller, loss! Awww...this is so sweet. 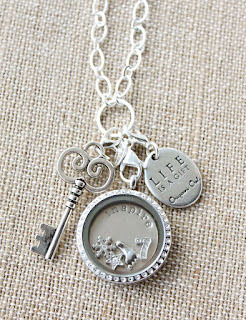 I love your locket. And your story. It's not about the numbers. It's about your health and A number is just a number. Don't let yourself get tied down to the numbers. You will feel different and you will know it is working. And don't beat yourself up if you can't do it all 7 days every single week. It's OK to not be perfect, as long as you get back on track. You can do it!